This tree (above) could smash those guys into the ground if it suddenly released its toe grip and gave them a fast stomp! 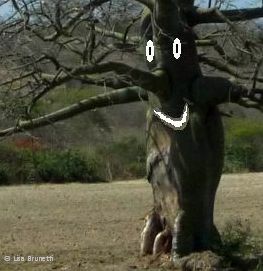 There are trees that seem to take human form and make us smile. Who doesn’t have childhood memories of climbing a tree and lurking in its branches, sometimes for hours? Imagine climbing a massive tree and then staying there for an entire day. An entire week. An entire month. An entire year! There’s a remarkable young woman who has done just that, and she is presently perched 60 meters high in an old eucalyptus tree! You HAVE to read this young woman’s story! Scram! Go there now via cybertrip to Tazmania and become part of Amanda Gibson’s cheering section! Exercise that ‘like’ button and give her a round of WordPress support! I had company visiting while I attempted to get this post out, and the error is all mine! Starts with a T and ends with an A! Woops! A 2-year old, a 6-year old, an 18-year old and one grandmother who had a lot to talk about, and i had paints and paintings all over the place! the 18-year old ádjusted my computer keyboard to spanish without telling me, so the commas, apostrophes and such were not where they should have been! Thanks for your comment or I might not have caught this until days later! Thank you, Thank you for the link! What an amazing young woman! Thank you for leading me to this remarkable and courageous young woman! We have a tribe in India called the Bishnois in Rajasthan,who resist logging fiercely. bu hugging trees!! I read the article about Amanda…inspiring and educational. Truly “out on a limb” for what she believes in. One determined young lady. Thanks for sharing this w/us, I plan to follow her journey.